When you come home from the grocery store, where do you put your perishable food? Could you pick up a gallon of milk, some frozen chicken, or a carton of yogurt without having a refrigerator or freezer at home? As consumers, we know the critical value of having reliable appliances to help us keep food fresh and safe to eat. But we also know the cost. Every day we work with our partner agencies to provide thousands of pounds of perishable food to people in need. But in order to do that safely and efficiently, our partners must have the proper equipment. No matter how many pounds of produce our volunteers can sort, how often our partners can pick up donations from retail stores, there is one piece of equipment we all know to be essential to the process: refrigerators and freezers. We are committed to providing the healthiest food possible to our most vulnerable neighbors. The challenge is that refrigerators and freezers are expensive. 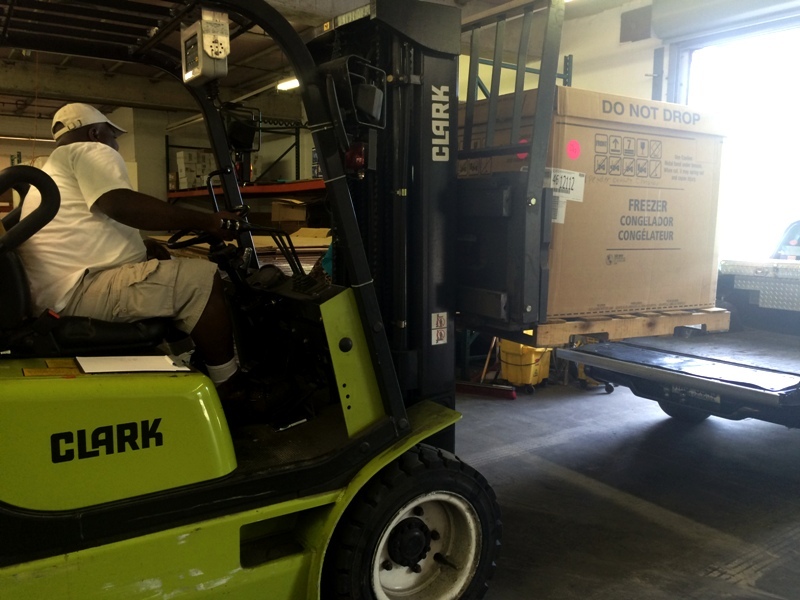 The service organizations we work with put as many resources as possible into feeding food insecure people, and that doesn’t always leave room in the budget to purchase major appliances. 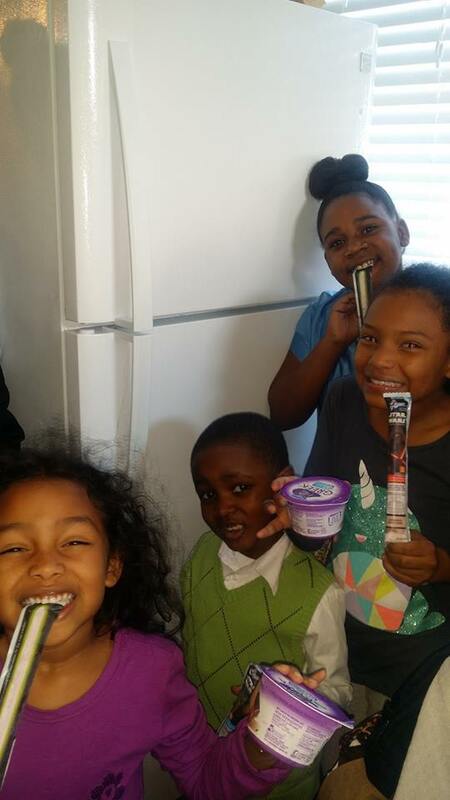 Kids from Pastor Audra’s Kids Cafe enjoy yogurt from their new refrigerator! 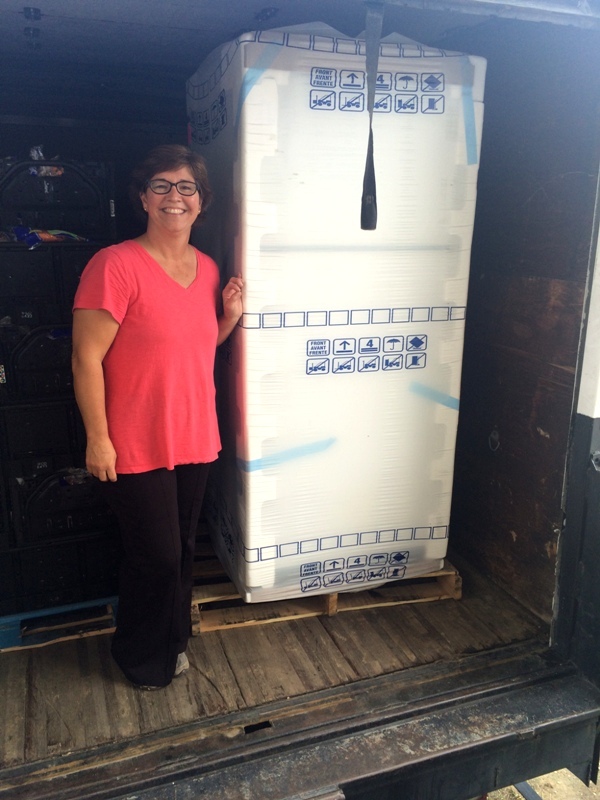 We would like to extend our sincere thanks to Walmart for the new refrigerator for our Food pantry. The refrigerator was delivered to us new and in excellent working condition. Thank you and your team for assisting us with the delivery since we are working towards securing a truck or trailer large enough to accommodate our large pick-ups and special gifts. The refrigerator donated to us by Walmart has helped tremendously in our mission to eradicate hunger in Pitt County. As you know, we extend nutritional assistance to families seven days a week, including two walk-in pantries a week and having an extra refrigerator has really helped keep our food items safe and secure especially since we have been experiencing some unseasonably warm weather lately. The refrigerator has also helped us with our free breakfast on Sundays to children and our Kid’s Cafe boxes. Again, we thank you and the Food Bank CENC & Walmart for your generous gift and your partnership and support. Pastor Audra Singleton, MSA, Ed. See below for more photos of our partners receiving their new equipment! 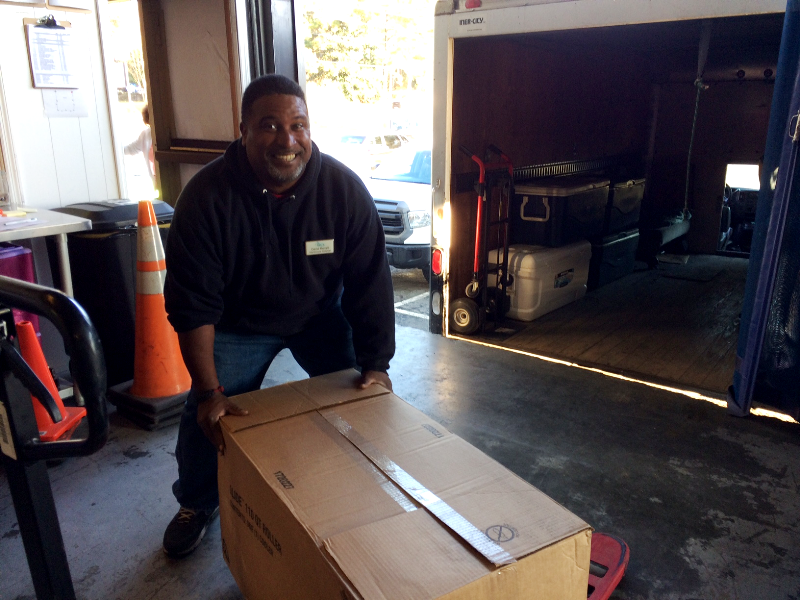 Food Bank staff in Wilmington load a chest freezer on a truck for our partner Pender County Christian Services. The Executive Director, Sandy Harris, expressed sincere gratitude for this gift and told us that the equipment was given just in time because their old freezer had just broken. She explained that the money they would have had to spend on replacing the freezer can now be spent on food for people in need in the community! In Pender County there are more than 9,000 people living with food insecurity, more than a third of whom are children. Dawn Ellis from our Wilmington partner Faith Harbor United Methodist Church stands excitedly next to her new refrigerator. Our partner Religious Community Services at our New Bern Branch picking up their new refrigerator. They serve more than 700 people through their food pantry and 4,000 through their soup kitchen every month. This new refrigerator will allow them to store more perishable food including fresh produce, all to be made into healthy meals for people in need. In New Bern and the surrounding area there are more than 18,000 people living with food insecurity, more than a third of whom are children. Thanks to a grant from the Walmart Foundation through Feeding America, 30 of our partners that pick up donations from local Walmart stores received new refrigerators, freezers, coolers, thermal blankets, and reusable ice packs. We are grateful to the Walmart Foundation for their commitment to expanding our Retail Recovery Program and increasing the capacity of our partner agencies to serve people in need.